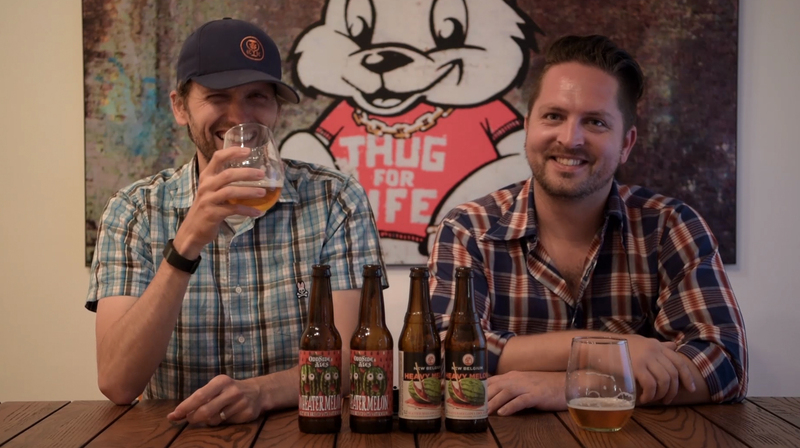 On episode 282 of the Hop Cast, Brad Chmielewski and Ken Hunnemeder are getting into the spirit of summer with a couple watermelon flavored beers. Fruit themed beers have become very popular ever since the Stiegl Radler (Grapefruit) exploded in popularity. Brewers are always looking for the next smash hit and this summer it seems like a lot of different breweries are looking towards watermelon. First up in episode 282 is the Wheatermelon from Odd Side Ales in Michigan. As we see in many of these fruit beers, the ABV is rather low which makes them a great session beer. The Wheatermelon comes in at an easy 4.0% ABV. The label on this beer is a bit scary but don’t let that turn you off. It’s a bit on the sweeter side but watermelon is such a light flavor that it’s often hard to pull off in small amounts. Following up the Odd Side, the guys move onto the Heavy Melon Ale from New Belgium. This beer takes a little different approach and is brewed with juicy watermelon and zesty lime peel. Coming in at 5.0% ABV, it’s slightly higher but very crushable. These are the sorts of beers you might want to dive into on a hot summer day. Cheers & thanks for watching the Hop Cast! Having issues listening to the video? Try the Quicktime (579.5 MB) or subscribe to the podcast on iTunes or Stitcher.